with Josh Summers, E-RYT 500, YACEP, Lic. Ac. Part of the 200-hr and 300-hr Teacher Training Certification in Yin Yoga and Meditation. Find a live teacher training module here on the list of upcoming events on Josh’s Events Page. For the event of your choice, register through the host studio for the live teacher training module. Pay the host studio directly. 2019 pricing is consistent: $840 USD (or $690 earlybird rate). Prices adjusted in Europe. Attendees, please note: You will receive an exclusive access code to the online course via email after signing up (please allow up to a week for processing). You will need to complete the online course, including a short quiz, before attending the live teacher training module. Estimated time to complete the online course: 5-7 hrs. Anyone can take this training as a standalone module, and all participants will receive a certificate of training which is eligible for 50 hours of Continuing Education Credit with Yoga Alliance. Further Questions? There’s more info about the Summers School of Yin Yoga on the Frequently Asked Questions page, or you can contact Josh here. The first time I participated in the Foundations Module in 2017, the study was new to me and the quantity of information daunting. I did, however, leave with what would become my growing Yin practice. Now, the new Foundations Module is an undisputed winner! The addition of an online course for preparation, an invaluable text (Your Body, Your Yoga by Bernie Clark) and an improved format have contribute to greater effectiveness. Josh has gathered many teachings and distilled them into what is immediately accessible and salient, all designed for health and well-being. I found this second foray into Foundations intensely meaningful and motivating. If you are new to the Summers School of Yin Yoga, you have come to the right place. If you have not yet participated in the Foundations Module, you have a treat in store. If you have previously done this module, revisit it – it’s different, dynamic and gets the job done. I’ve been a student of Josh Summers for many years. I took Josh’s Foundations Teacher Training Intensive in 2013 and the Mindfulness Intensive in 2015, both of which formed a solid foundation to teach Yin Yoga. 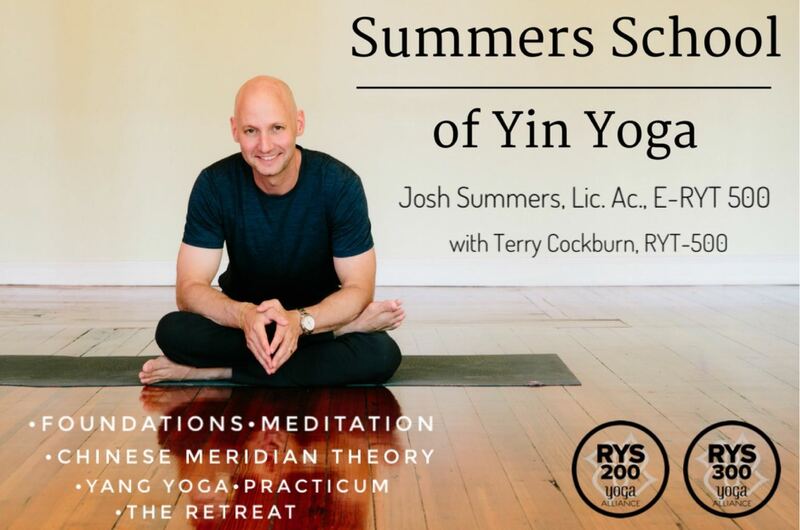 I decided to repeat the Foundations Module as part of my 200-hour requirements for the Summers School of Yin Yoga because I was excited to experience Josh’s new offerings. I am so happy I did! 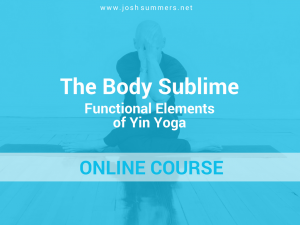 Josh’s new format for this module is outstanding, comprehensively covering the basic theories of Yin Yoga practice and teaching with a pointed focus on the physical aspects of practice. The informative online course – a prerequisite for attending the in-person training – ensured that all attendees had a basic understanding of the material, allowing us to dive deep into the material. The format of the in-person training is genius. Each day includes in-depth and interactive investigation of Yin Yoga postures, interesting lectures, lively and on point group discussions, and solid practice time to fully integrate what we learned that day. The very thorough course manual, which includes pictures of all of the Yin Yoga postures plus many modifications, is now a go-to resource for me. Josh is an accomplished facilitator and trainer, deftly navigating group dynamics and complex topics. I rate this course 10+ out of 10, and recommend it to new and seasoned Yin Yoga teachers and practitioners, including those who have previously completed teacher training modules with Josh. I took Josh’s intro to Yin Yoga in 2014. Back then, it was just a two and a half day weekend, and I was introduced to the philosophy and practice of Yin, all Yin poses, traditional Chinese medicine, and meditation. This past January, I took his new module called Foundations of Yin Yoga, which is now a four-day intensive course on just the physical aspect of Yin Yoga. This module is a complete and comprehensive overview of what Yin Yoga is, as well as all Yin poses and its target areas and modifications. Packed with information, this course will answer all your questions about Yin Yoga and get you inspired to further pursue this wonderful practice. I learned so much from this new version of Foundations. It always becomes clear in any profession when someone has deep-rooted knowledge and can deliver it in a way that works – when it’s lasting, when it’s the real deal. That’s Josh. Over the past decade, I’ve watched Josh develop one of the most comprehensive and critically acclaimed Yin Yoga offerings – and now a complete Yin Yoga program with yinyogaschool.com. I’m in awe of all he has accomplished. Intensive training in Yin Yoga and Meditation. Students can choose to work towards a 200-hr or 300-hr certification.